Although the Hospital of the University of Pennsylvania started a nurse training program as early as 1886, the University did not begin its nursing degree program on a collegiate basis until 1935 when, at the request of the Board of Directors of the Pennsylvania State Nurses Association, the Board of Trustees of the University authorized the establishment of a Department of Nursing Education in Penn’s School of Education. Katherine Tucker was appointed Professor and Director of the department, a position which she retained until her retirement in 1949. Programs leading to the degree of Bachelor of Science in Education, with majors in nursing education and public health nursing, were offered to graduates of hospital nursing schools. Courses were also offered in Extension Divisions to nurses in eastern Pennsylvania and Delaware. 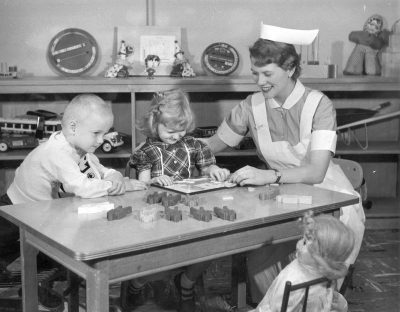 In 1937, a program leading to the degree of Master of Science in Education with a major in nursing education was established. In 1944, the Trustees of the University further authorized the establishment, in the Division of Medical Affairs, of a Basic Collegiate School of Nursing with a five-year basic program leading to the degree of Bachelor of Science in Nursing. Theresa I. Lynch was appointed Director (the title was changed to Dean in 1946). In 1949, Lynch was appointed Director of the Department of Nursing Education, in addition to her responsibilities as Dean of the Basic School. In 1965, Dorothy A. Mereness became the second dean of the School of Nursing. In 1966, major changes in the Master’s curriculum were initiated. Admission and promotion standards were raised and implemented. The curriculum was lengthened from two academic semesters and two summer sessions to four academic semesters. All the clinical programs were reorganized. The School celebrated its silver anniversary in May 1975. In 1977, Claire M. Fagin became the third dean of the School and held the position until 1991. Norma M. Lang, the fourth dean, served from March 1992 to August 2000.